Happy Kitchen Sink Stamps Monday, I hope you had a great weekend! 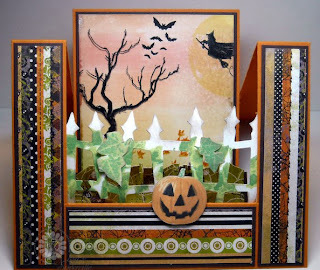 This week brings a new Kitchen Sink Challenge with Makiko as your Hostess, her challenge: Trick or Treat....make a card/project for Halloween, using Kitchen Sink Stamps. Remember to be eligible for the random prize drawing your projects must use Kitchen Sink Stamps, read the full details here. The Multi Step Ivy was stamped on White card stock, then cut with the Sizzix Fence Die, I stamped a few more pieces of Ivy and popped them up on the fence. The pumpkin was also stamped on White, then popped up on the fence. Behind the fence on the next "step" I added some grass using Basic Grey Eerie Paper, on the "large center step", I Pumpkin Patch Ink and the Spectrum Roll Technique to create the Background, then added images from the Multi Step Owl & Autumn Moon and Friends of the Moon sets. This is such an exquisite piece of art!! You blow me away with your creativity and talent, Lisa!! 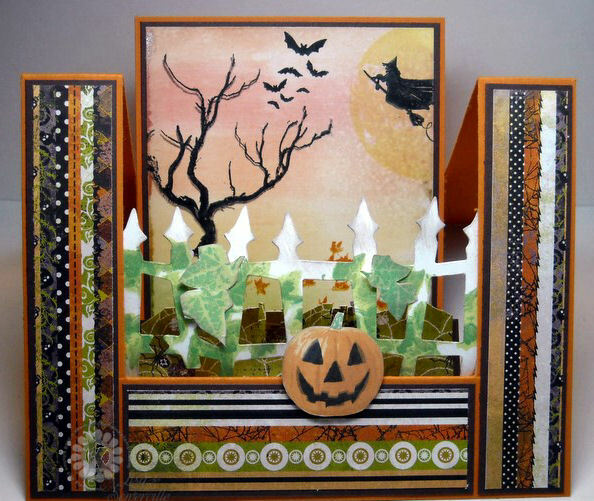 Your center step design is perfect for framing this sensational Halloween scene. Love the ivy on the fence forefront and the beautiful spectrum roll background for your flying witch! Wowza!!! This is incredible, Lisa!! Beautiful work of art! Lisa, this is like a little story book! I love this absolutely lavish Halloween display! Have a wonderful day! Fantastic card, love the fold of it and the scene-would make a great display! Oh my, Lisa!! What a wonderful scene you have created here!! I just love all the deatils...I have never tried this technique...looks like fun!! WOW! The layers are wonderful and all the details with the pumpkin, the ivy on the fence and the wonderful scene in the background. Gorgeous! Truly fine artwork! Wonderful spooky scene! What an awesome piece. The ivy on the fence is such a creative detail.